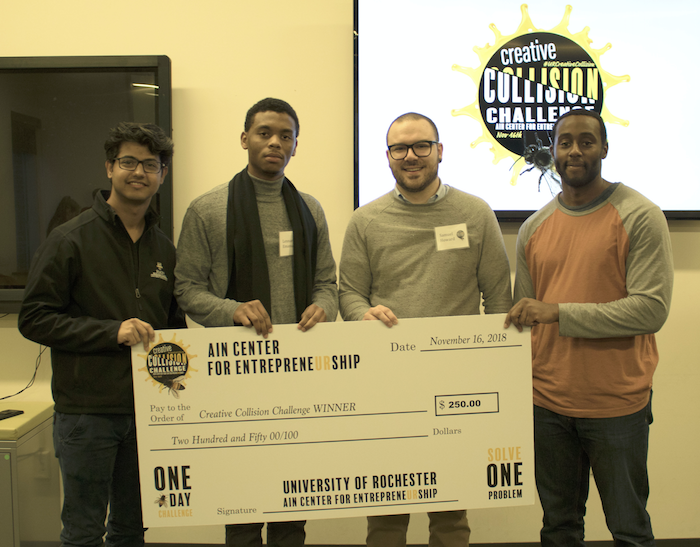 Last semester, the Ain Center held the inaugural Creative Collision Challenge, a one-day competition that brings together students from a variety of backgrounds to tackle a pressing social issue. MBA candidate and Ain Teamer Gregory Scott competed in the Challenge, taking home third place with his team Bee Aware. Greg shares some of his insights from the competition here. One in three bites of all food is pollinated by bees. Yet, winter honey bee colony loss continues to reach unprecedented levels in various regions around the world. How should we protect our bees to ensure humans have adequate food supplies in the future? 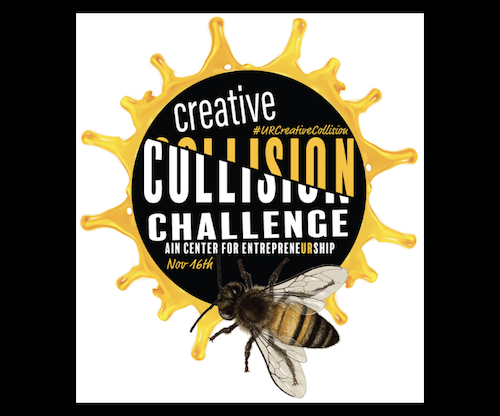 The Creative Collision Challenge was held on November 16. 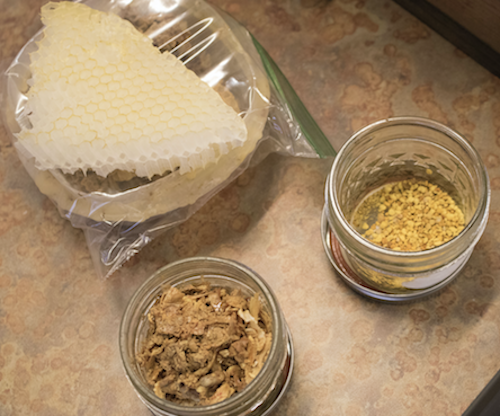 Supplies for beekeeping brought in by mentor Willa Powell. The Creative Collision Challenge tackled this very problem. Ain Center staff combined students from unique academic backgrounds to analyze this dramatic decline in the bee population, brainstorm a solution, craft and deliver a ten-minute presentation within a four-hour window to a panel of expert judges. After pitching our slide decks, judges deliberated and awarded three cash prizes to the top-performing teams. And more importantly, teams got the chance to work on a pressing social issue and were challenged to generate and transform actionable ideas into enterprises that would actually create economic or social impact. Shortly after the formal introductions, we all scampered off to various corners of Rettner Hall and began to ideate. My team consisted of four people from three different countries. Two of my teammates were engineers, one was an MBA student, and three of us had previous start-up/entrepreneurial competition experiences. While we worked, special experts and beekeepers from the Rochester community met with each group to discuss the process of beekeeping and even gave us a taste of real Rochester honey! After discussions with the experts and beekeepers, we began what in retrospect may have not been the most important discussion–our team name. After some rumination, we decided on the name “Bee Aware” and started to work on our slide deck. As we designed our deck, we realized that although the bee population reductions statistics are quite clear, the potential causes and solutions are not. 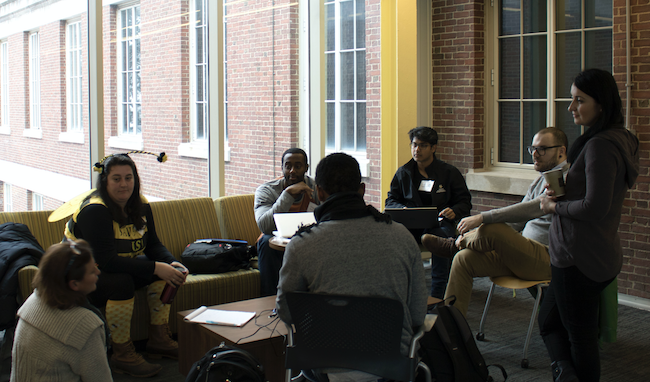 Team Bee Aware with a variety of mentors and subject matter experts during the one-day challenge. As we scarfed down our Chipotle burrito bowls, we discovered that monoculture farming, climate change, and wifi are just three of the other purported factors that kill bee colonies. We needed to first agree on the most salient cause so that we could develop a fine-tuned solution. We decided that systemic pesticides were undoubtedly the largest harm to bees. After agreeing on the cause, we raced against the clock to organize our slides and do a dry run, as we would be first team to present. At 1:44, one minute before the slide deck delivery deadline, Bee Aware submitted its slide deck. We had just enough time to do one rehearsal. Shortly after, all the participants reconvened in Creative Collision room for the presentations. We delivered our presentation and took questions from the panel of expert judges. The judges’ questions were helpful and gave my team a framework for how to deconstruct ambiguous issues in a short time-span and how to better substantiate our proposal. After about fifteen minutes of deliberation, the judges decided that team BeeHouse’s technology enabled bee hive that incorporates live data transmission about bee health took home 1st prize. Our team’s three-tiered solution to ban systemic pesticides, subsidize beekeepers, and fund national bee research/education took home the 3rd place prize. 2nd place was taken by To Bee or Not to Bee who proposed a pesticide tax and subsidies to beekeepers. Team Bee Aware: Aman Tugnawat, Lennard Emanuel, Samuel Howard, and Gregory Scott. Despite not winning the competition, I had an awesome time at the Creative Collision Challenge. Not only did I learn about a complex social issue, but I was able to make new friends with a diverse set of classmates. As a result of the Creative Collision, I have also learned to try to avoid myopic views on a subject by listening to the ideas of my classmates. To build a truly innovative solution to a global issue, it is important that we leverage different academic and geographical perspectives. Lastly, the chance to eat local honey and see how actual beehives work really excited me about one day becoming a beekeeper myself. Gregory Scott ’20S (MBA) is a first-year MBA student at UR’s Simon Business School. Greg also graduated from the University with a BA in International Relations in 2015. We hope you are! Take a glance at what the Ain Center has to offer this spring. We can’t wait to get started. Learn about upcoming programs and projects here. 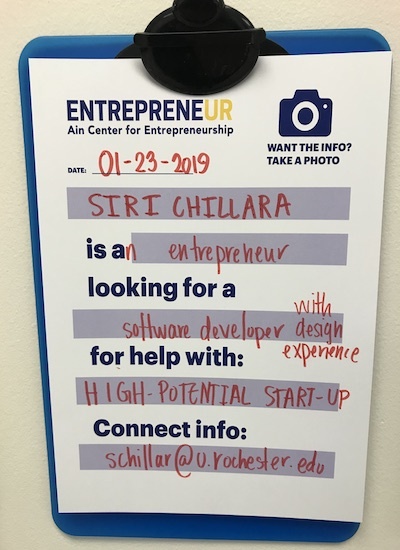 Spring 2019 is the time for innovation! Learn from lessons shared by local entrepreneurs. Hone your skills and add to your resume. 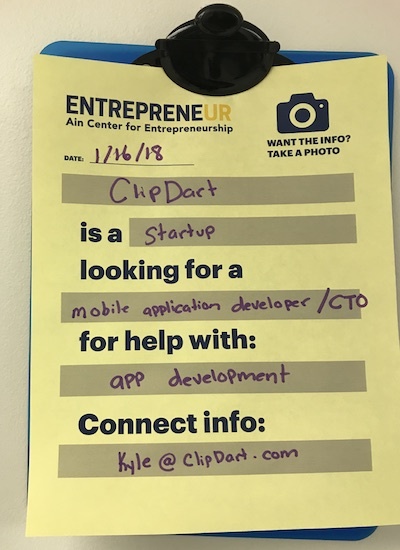 Pitch your ventures and gain valuable feedback. 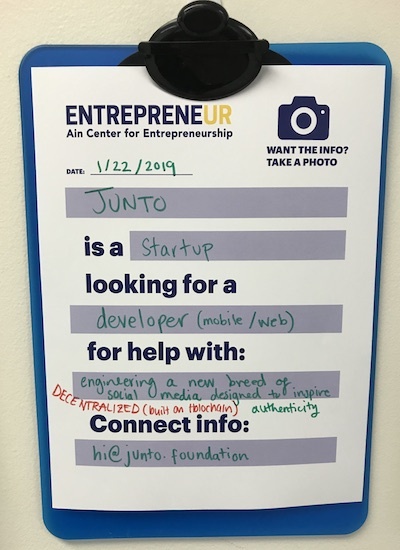 Connect with peers and regional innovators. Ready to begin your entrepreneurial pursuits or expand your current venture? 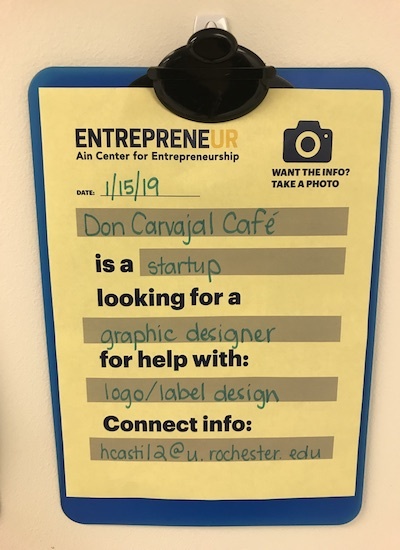 Send any questions our way to AinCFE@rochester.edu or drop by our office (1-211 Carol Simon Hall) to say hello and set up an appointment. 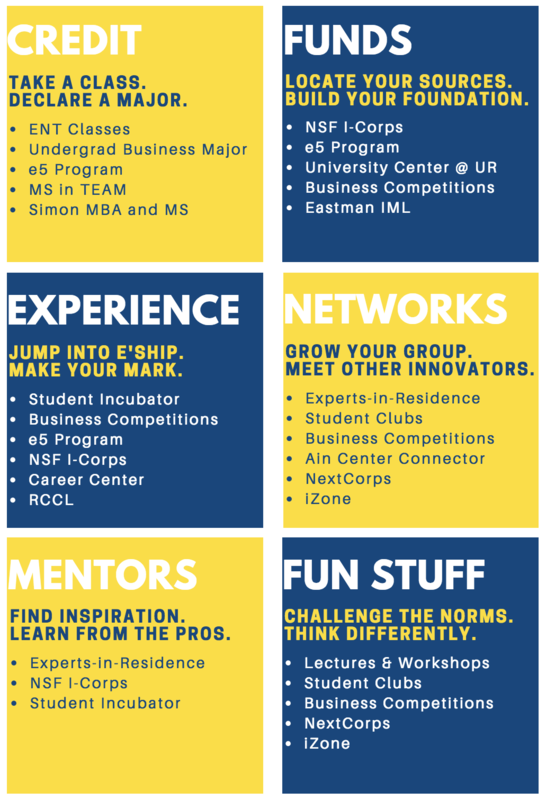 We have so many fantastic opportunities for you this semester – we’ll see you soon!